In the scientific world Pluto has always been a hot topic. Since its declassification as a planet in the Solar System on August 2006, it has sparked many debates about the dwarf planet. Some of those debates consists of whether or not Pluto is actually a planet based on its features. You would be surprised to know how similar to our Earth Pluto is, especially after some of the discoveries made by the New Horizon probe flyby on July 14th. Until the flyby of the New Horizon probe around Pluto, it was widely believed that the planets and moons outside of the Asteroid Belt weren’t geologically active unless acted upon a huge source of gravitation pull from the gas giants Jupiter, Saturn, Uranus, and Neptune. It was also believed that Pluto would have many impact craters due to its close proximity to the Kuiper Belt, but Pluto has proven otherwise. From the images received from the New Horizon probe, it is clear that Pluto doesn’t have any major craters. It is also clear that the dwarf planet also has mountain ranges and volcanoes, some which are now believed to be active. This is the first sign of an active rocky dwarf planet outside of the Asteroid Belt. Who would have thought Pluto, the farthest ex-planet, to be geologically active? One of the biggest similarities that Earth and Pluto share is their relations to their moons. Both our moon and Pluto’s biggest moon Charon were created due to planetary impact. It is widely believed that around 4.5 Billion years ago, a planet the size of Mars collided with Earth to create the present day Moon. Charon, Pluto’s largest moon, is also the result from a direct collision from Pluto with another planet of its size. In comparison our Moon is about ¼ the size of Earth. Charon in the other hand is about ½ the size of Pluto. Both our Moon and Charon are also tidally locked to their host planet. That means that the same side of the moons always faces the planet due to their huge size in comparison to their planets, the gravitational pull from the two bodies, and their rotation as well. Pluto and Charon in the other hand is a more extreme case because both Pluto and Charon orbit a point in-between the two systems resulting in only one side of Pluto always facing Charon as well. Pluto’s Atmosphere One of the biggest surprises to NASA and Scientists have been the newly discovered atmospheric tail of Pluto. Even though we knew that Pluto had an atmosphere, we were unaware of how big the atmosphere is. 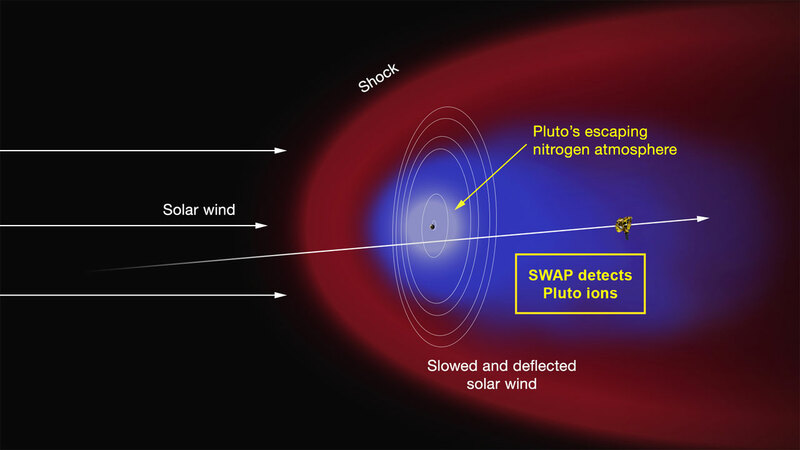 Pluto’s atmosphere and its tail, which is mostly compromised of Nitrogen (similar to Earth), expands anywhere between 48,000-68,000 miles behind the Planet. This is due to solar winds which strip the Nitrogen and other atmospheric particles out of the planet’s atmosphere and into space. 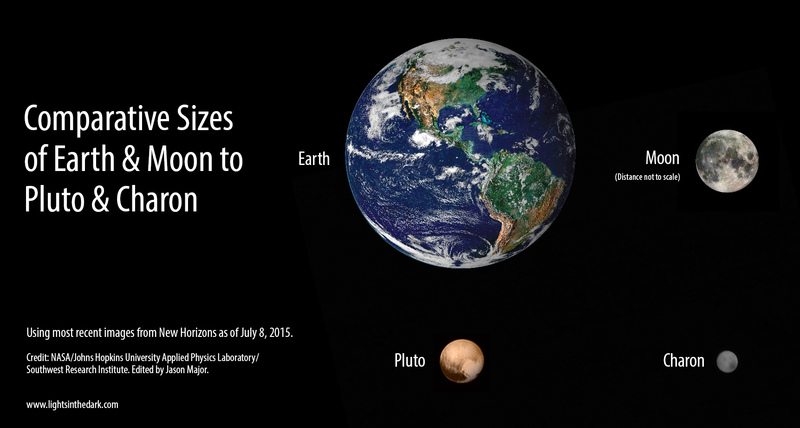 This loss of atmosphere causes Pluto to lose mass and essentially shrink in size. The same thing happens with many other planets such as Mars and even our Earth. Don’t worry though, our atmosphere will last for a very long time. What’s Next for the New Horizon? The New Horizon probe has already made some astonishing discoveries about Pluto in the past week and there are many more discoveries to be made. The data collected by the probe travels at the speed of 2 kbps [very slow] to Earth and it will take nearly a year for us to get the complete picture of Pluto as the New Horizon saw it. The New Horizon is currently beaming past Pluto at speeds of over 10 miles per second (36,000 mph) but its mission isn’t over yet. NASA still have to receive all the data collected by the probe before it can move to its next mission which is located in the Kuiper belt. The team for the New Horizon would like to study the other dwarf planets that exist in the region, but at the moment the mission is pending approval.